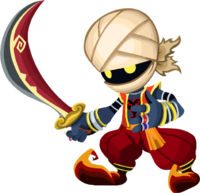 The Red Bandit is a Heartless that appears in Kingdom Hearts χ. The Red Bandit's appearance mirrors that of a regular Bandit. The Red Bandit wears a tan turban and matching face mask that meet together in the back. Other components of the Red Bandit's attire include a bright orange vest trimmed in a yellow outline, crimson colored pants with a gold trim that are held together by an orange sash, red shoes that begin a dark red on the soles but gradually lighten, giving the shoes' tips a flame-like appearance, a silver choker, and an assortment of arm bands, bracelets, and rings. They wield a large, gold-hilted scimitar, with half of the blade a panel of dark red with a center tan line that crookedly spirals towards the tip of the blade. The "bandit" portion of the Red Bandit's name is a reference to the Arabian outlaws that would commit various crimes.